The Finback Whale is the second largest animal after the Blue Whale. It can grow to a length of 26m (85ft) and weigh 30-80 tonnes but on the average it is much smaller. The Fin whale is called a "rorqual" a Norwegian word for "furrow" and refers to the pleated grooves running from its chin to its navel. The throat grooves, in addition to streamlining the shape of the whale, allow the throat area (cavum vent-rale) to expand tremendously during feeding. This allows the taking in of tonnes of food-laden water which is then discarded through their baleen plates leaving the fish or krill for swallowing. This efficient system enables the largest animals on earth to feed on some of the smallest. The Humpback whale is one of the most energetic of the rorquals. It is known for its spectacular breaching, flipper-slapping and lobtailing. It is easily identified at close range by its knobbly head and long flippers. The black and white colouration on the underside of the flukes (tail) allows scientists to distinguish and name individuals all around the world. No two Humpback whales are exactly alike. Bay of Fundy is an eco-attraction on par with such marvels as the Great Barrier Reef of Australia and the Rain Forest of Brazil. It's mighty tides are the greatest on earth. Every day, twice daily, one hundred billion tons of seawater roll in and out of the Bay. At low tide, you can literally walk on the ocean floor. At high tide, just six hours later, your footprints will be covered by the ocean. In some places, the vertical difference between high and low tide is 14 meters- roughly the same height as a four storey building! Fundy's onslaught of water every 12 hours and 30 minutes is estimated to nearly equal the 24 hour flow of all the rivers in the world! How nutrient-rich are Fundy's waters? In just two weeks, sandpipers feeding on Fundy shores will double their weight! Bon appetit!! For many people, the only whales they ever see are in the movies, or in large tanks in aquariums. Come to Digby Neck and see them up close, in their natural habitat! 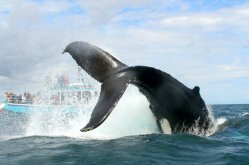 The rich feeding grounds around the Fundy Isles in southwestern Nova Scotia make the Bay of Fundy one of the world's most accessible sites for viewing marine mammals. Every summer whales of all sizes (up to 15 species of toothed and baleen whales) come to the Bay of Fundy, one of the marine wonders of the world, to mate, play and feast on the bountiful supply of food churned up twice a day by the powerful tides. The stirring of deep nutrient-rich water into shallow surface water causes immense blooms of plankton - passively floating food that nourishes all marine life. That's more kinds of whales more often than anywhere else! 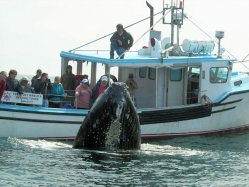 From Digby Neck which is located 2.5 hours south west from Halifax you'll have the best possibility for whale watch tours. 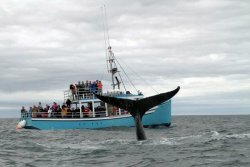 The Bay of Fundy is a world renowned whale watching area, with tour boats sailing from the Digby Neck shores on a daily basis from June through October. You can sail from Digby, Tiverton or East ferry, or you may choose to embark from the spectacular Brier island in the Bay of Fundy. Among the species regularly sighted are humpback, minke, finback and the rare North Atlantic right whale. It is this species that is most at risk from human activities in its habitat areas. The North Atlantic right whale is the world's rarest large whale; fewer than 350 remain alive today. Originally reduced by commercial whaling, the right whale continues to face many problems on its slow road to recovery. Right whales die from collisions with ships and entanglement in fishing gear. Because of its rarity and other factors which hamper its struggle to survive, it is vitally important to the survival of this species that all possible potential for disturbance be eliminated. Whale watching is one of the most rapidly growing tourist activities worldwide. In many areas, the whale watching industry has heightened local interest in marine mammal conservation as well as bringing significant and much needed economic growth. Other positive impacts of whale watching include public education and contribution to scientific studies of various whale species. Whale watching can be fun and educational, but great care must be taken in order to ensure that the animals are not disturbed. As a whale watcher, you can play an active role in seeing that your whale watch experience is a safe and enjoyable one - for you and the whales.